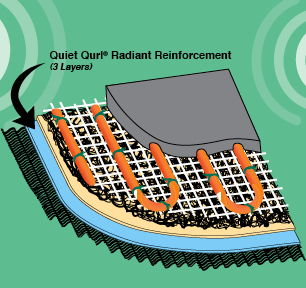 Keene Building Products has a new product called Quiet Qurl® Radiant Reinforcement 025 MC. It is a sound control mat used to reinforce gypsum concrete and many types of concrete in radiant tubing applications. The 0.25” thickness is perfect to provide the added strength and the new added 3rd layer of polyester scrim provides a mechanical method to tie radiant tubes in place so that they do not float. The scrim resists alkalinity. The material works in sound control applications where no mechanical fastening is allowed to the subfloor. QUIET QURL® RR 025 MC works in concrete and wood construction. Sound applications require a loose, unfastened installation. Radiant tubing applications are typically mechanically fastened to the subfloor with staples. Without the mechanical fastening, the radiant tubing will float in a concrete or gypsum concrete underlayment. Even tubes filled with water are lighter than typical underlayment products and can pull away if not properly fastened. In sound control applications, 10 AWG wire reinforcement or expanded metal lathe has been used to wire tie the tubes and provide weight to hold tubes in place, preventing the use of fasteners through a sound control mat. Quiet Qurl RR utilizes a three layer design to provide a means to tie tubes while using the weight of the gypsum concrete to prevent floating. The bottom layer is a moisture resistant fabric that holds the composite in place & the tubes in position.